Since Tinos Town has a year round population of about 3,000 (with an overall island population of about 8,000), there is always a feeling of hustle and bustle in the air as the locals go about their daily routine. 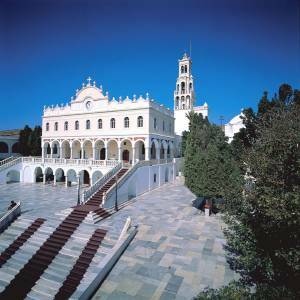 During summer, the town is bursting at the seams with Greek visitors making their pilgrimage to the famous Church of the Panagia, by far the most important structure on the island and one of the most interesting. A visit to the Church of the Panagia is, of course, essential in satisfying your curiosity as to why all of these people are here! It is also significant in understanding a bit about the Orthodox religion and learning why this miraculous Icon is so important to the faithful. The Icon was discovered on 30 January 1823, after the Virgin Mary had earlier appeared in a series of visions to a local nun. The nun, Pelagia, resided in the Tinian Monastery of Kechrovounie, where the visions occurred. With the help of local residents, the Icon was found buried amid the destroyed ruins of a Byzantine chapel on what was then farmland and what would soon become the site of the church. Tinos End of Pilgrimage: People crawling on their knees all the way up from the port to the Church to have their wish fulfilled. Tinos calm siesta hours! Notice the flower drawn on the pavement! Tinos open-air Restaurant. What you cannot see are birds in the foliage singing!